RIP Chris Kelly aka Daddy Mac of Kriss Kross | hesaidwhatnow? In a very sad day for lovers of 90s rap, weird hair, and getting dressed in the dark, Chris Kelly, one half of rap duo Kriss Kross, died today. Kelly, aka Mac Daddy, and his hip hop partner, Chris Smith, aka Daddy Mac, burst onto the music scene in 1992 with their song Jump. It was number one on the US Billboard Charts for eight weeks and ended up a double platinum hit. Admittedly they didn’t do much after that, but still, that’s one more number one single than Bob Marley ever had, so obviously they’re better, right? Details are unclear at this stage as to how Kelly died, so I don’t want to Jump to any conclusions (zing!) but early reports suggest that it might be a drug overdose, which would be wiggedy wiggedy wiggedy wack. Either way, at just 34, Kelly’s life is Totally Krossed Out. 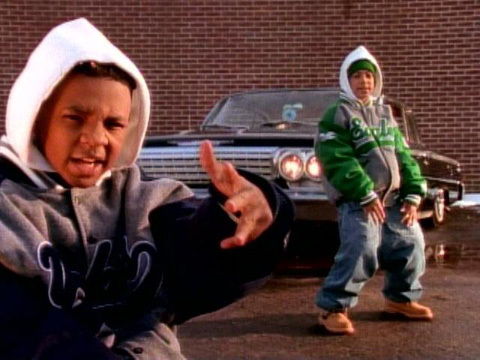 This is the only image of Kriss Kross in which they are wearing some clothing the correct way around. Meanwhile there were two things reported by the media that haven’t been given enough attention. Firstly, the investigator from the Fulton County Medical Examiner’s office in charge of investigating Kelly’s death is named Betty Honey. Clearly this is a hip hop alias, and I for one am concerned that there’s a conflict of interest here. If I had anything to say about it, I’d ensure Honey kept her sticky fingers out of the situation. Secondly, multiple media outlets have reported that during the height of their popularity, Kriss Kross released a video game. For some reason, I find this the most disturbing aspect of the story. But it is always sad whenever someone dies before their time, even if we haven’t heard from them in over two decades. So I urge everyone to pay tribute to Mac Daddy in the way that we know he would appreciate the most – by wearing our clothes backwards tomorrow. wow I hadnt heard that.. kris kross was back in tha day!